According to a global survey - What Worries the World - by Ipsos, it has been observed that Indians are more concerned about terrorism, leaving unemployment and the political corruption behind. As terror has taken centre stage in the aftermath of the Pulwama attack in Kashmir, around 45% of the respondents said they were most afraid of terrorism in the country. In the run-up to the Lok Sabha elections 2019, politicians are campaigning tirelessly, notwithstanding the blistering heat. But sadly, their campaign narrative is limited to throwing tantrums at one another, most often personal and nasty, while the citizens expect leaders to take up serious issues. According to a global survey - What Worries the World - by Ipsos, it has been observed that Indians are more concerned about terrorism, leaving unemployment and the political corruption behind. While terror has taken centre stage in the aftermath of the Pulwama attack in Kashmir which left 40 paramilitary troopers dead, around 45 per cent of the respondents to the survey said they were most afraid of terrorism in the country. Apart from terrorism, 44 per cent of the respondents said they were worried about unemployment, and 42 per cent mentioned political corruption. A significant number of the countrymen also expressed concern over Crime and Violence, 33 per cent, and Poverty and Social Inequality, 29 per cent. When it comes to 'world worries', terrorism does not even feature in the top five, as per the survey. Around 34 per cent of the global population worries about political corruption and social inequality, followed by unemployment, 33 per cent, crime and violence, 31 per cent, and healthcare, 24 per cent. On one hand 73 per cent of Indians feel that the nation is headed in the right direction, on the other hand, 22 countries out of the 28 nations covered feel their country is on the wrong track, according to the survey. China is the most confidence nation about its course with at least nine in 10 Chinese citizens saying that China is moving in the right direction. Saudi Arabia is in second place, followed by India and then Malaysia. "Pulwama terror strike has propelled terrorism to the fore. It was way down in the pecking order in the past waves. Terrorism is bothering the Indians the most. 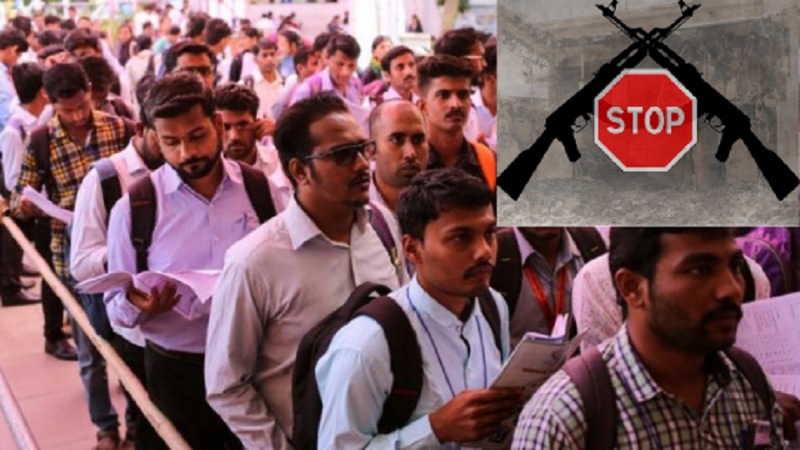 Likewise, lack of jobs is weighing on the minds of Indians and government needs to take the bull by the horns and actively needs to address job creation and tighten its stranglehold on terrorism," said Parijat Chakraborty, Service Line Leader, Ipsos Public Affairs, Customer Experience and Corporate Reputation to a news agency. 'What Worries the World' survey has been conducted in 28 countries, including Argentina, Australia, Belgium, Brazil, Canada, Chile, China, France, Great Britain, Germany, Hungary, India, Israel, Italy, Japan, Malaysia, Mexico, Peru, Poland, Russia, Saudi Arabia, Serbia, South Africa, South Korea, Spain, Sweden, Turkey and the United States of America. This is a monthly online survey of adults below 65 years of age.